Massachusetts workers' compensation programs provide no-fault insurance for lost wages, medical costs and death benefits for Massachusetts workers who are injured or killed while working and performing their normal job requirements. Workers' compensation death benefits may also be provided to certain surviving beneficiaries if a worker dies. Workers' compensation was created to avoid personal injury lawsuits. Workers no longer have to file personal injury claims and sue their employer to prove the employer's negligence led to their work injury. Instead, workers' compensation provides immediate medical benefits and lost wage compensation to the employee, and in most cases, the employee forfeits their right to sue their employer to receive more compensation. Massachusetts Workers' Compensation Act was enacted in 1911. The Division of Industrial Accidents (DIA) administers the compensation system from Boston, Fall River, Lawrence, Springfield and Worcester. A commissioner, 21 trial judges and six appeals judges are appointed by the Governor of the state of Massachusetts. The DIA ensures that companies follow workers compensation laws and injured employees receive the benefits they deserve after a Massachusetts' workplace injury. Approximately 50% of workers' compensation claims are not disputed in Massachusetts. If your work comp claim is disputed it is recommended that you seek legal advice for your Massachusetts workman's compensation claim by hiring a work comp attorney. Work comp lawyers can review your case and make sure your interests are protected. If you have a serious or permanent work injury, or if you have been discriminated or fired for your injuries talk to a lawyer. 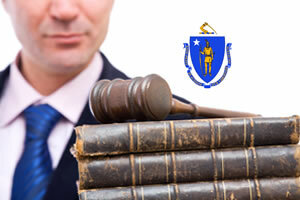 Massachusetts work comp laws can be complicated and will vary from other state's laws. Your employer or the insurance company may be more concerned with closing the work comp case and less concerned with ensuring you get the medical benefits needed to help you recover from your work injuries. If you choose not to hire a lawyer you may file a claim and present your own case before the DIA. Massachusetts workman's compensation insurance provides benefits for most Massachusetts workers who are injured on the job. Currently most Massachusetts private sector employers are required to buy workers' compensation or qualify as self-insurers. Coverage is elective for some workers such as seasonal, casual workers or part-time domestic workers. Some municipalities such as such as Hopedale and Tewksbury have not accepted the Workers' Compensation act and others such as Lawrence, Newton, Brookline, Brockton, and Beverly do not cover certain professions such as teachers or other white-collar employees. If you are in a city or municipality which does provide workers' compensation you may be ineligible to receive benefits if you are injured while performing certain actions which are intentionally harmful to yourself or another employee. Injuries you obtained while engaged in a social or recreational activity at the work place which was not "job-related" may also not be covered by workers' compensation. Massachusetts workers' compensation provides benefits similar to other states, but the terminology differs. Massachusetts workers' compensation provides medical benefits, death benefits and wage loss compensation. Massachusetts workers are entitled to adequate and reasonable medical care. For your first visit to the doctor or hospital, your employer has the right to designate a healthcare provider within the employer's preferred provider arrangement. After your first visit you have the right to choose your down doctor. Medical care is provided as long as medically necessary due to your work injury or illness. Temporary Total Incapacity Benefits are offered to workers who are unable to work for six or more full or partial days (the days don't have to be consecutive). Your benefits will be 60% of your gross (pre-tax, pre-benefits) average weekly wage. These benefits are available for up to 156 weeks. You will not be compensated for the first five days of missed employment unless you are disabled for 21 days or more. Partial incapacity benefits are offered to workers who can work but who have lost functionality due to their injury or condition. According to the Commonwealth of Massachusetts Department of Industrial Accidents, "The maximum compensation under Sec. 35 is up to 75% (.75) of what your weekly total temporary benefits would be. For example, if you receive $440 a week as a total temporary benefit, the most you could receive if you collected partial benefits would be $330 a week ($440 x .75 = $330)." These benefits are provided for up to 260 weeks. Permanent and Total Incapacity benefits are provided to workers who are unable to do any type of work due to their work injuries. Permanent and Total Incapacity benefits will be "two-thirds of your average weekly wage (or a minimum of 20% of the SAWW) based on the 52 weeks prior to your injury, up to a maximum of the State's Average Weekly Wage (SAWW)." You are also entitled to annual Cost-Of-Living Adjustments (COLA). Benefits are provided as long as you are disabled. Benefits are provided for Permanent Loss of Function and Disfigurement if you have suffered permanent loss of a specific bodily function or if you have scarring or disfigurement on your face, neck or hands. Benefits are paid one time for the scarring or disfigurement in addition to other benefit payments. The amount paid will depend on the location and severity of the disfigurement or functionality lost. If a worker is killed in a work accident or from a job-related injury the spouse and children of the worker are entitled to benefits (the child must be under 18 years of age or unable to work due to a disability). Survivor benefits are equal to two-thirds of the deceased worker's average weekly wage, up to the maximum of the State's Average Weekly Wage (SAWW) in place at the time of their injury or illness. Benefits are paid until the spouse remarries or is deemed no longer "dependent." If a worker dies workers' compensation will pay burial expenses up to $4000. Vocational Rehabilitation Services are offered to employees to help them return to work earning an income which is comparable to what they were making prior to their work injury. According to Commonwealth of Massachusetts Department of Industrial Accidents, the Rehabilitation services can include "vocational testing and training, counseling or guidance, workplace modifications, formal retraining, and job placement assistance." Under some conditions the insurance company may offer you a lump sum settlement for your work injuries and subsequent loss. The lump sum settlement does not affect your medical benefits. Talk to a work comp lawyer before accepting any lump sum settlement to ensure you are getting enough compensation to cover your injuries. If you have suffered a work injury and you will be absent from work for five days your employer must file an Employer's First Report of Injury or Fatality (Form 101). A copy should be sent to the DIA and to the employer's Workers' Compensation insurance company. The workers' benefits may be terminated by a Reviewing Board, court, arbitrator or Administrative Judge. The workers' benefits may be terminated if they return to work. Benefits can be re-activated if the worker stops working due to the same injury within 28 days. The worker is given a medical report by their treating doctor or impartial medical doctor stating they are capable of returning to employment. The worker refuses to participate in vocational rehabilitation services. The worker refuses to get medical care or go to a required medical evaluation. The worker is imprisoned for a felony or misdemeanor conviction.